People are more comfortable to meet up and connect with those with similar interests, personalities, and problems. 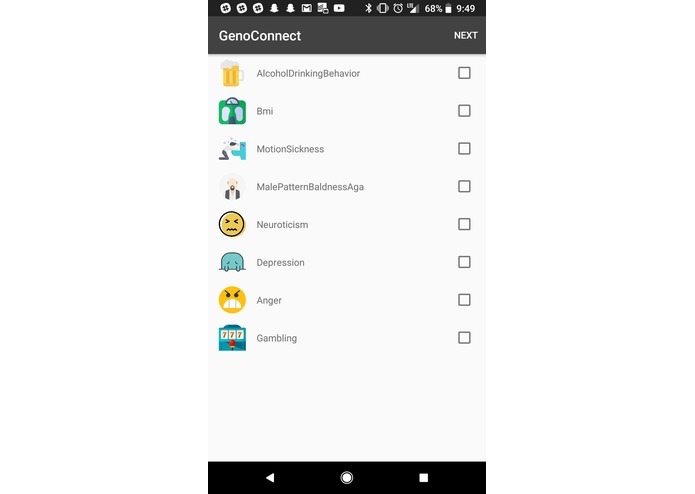 GenoConnect takes your genome, provided by the Genome Link API and matches you up with other users of the application who have a spectrum of genomes similar/dissimilar to you. The user can decide the index of similarity that they wish to see in the other person/people in the application, and can then join a 1:1 or a group chat with several different individuals! We built this application with android-studio and using Kotlin, the new programming language that developers are starting to use for developing Android applications. We use the SendBird sdk in order to connect users to chat rooms and have our own pattern matching algorithm to decide which user(s) to connect! We ran into several challenges with using Kotlin since it is still a relatively new language and does not have as much documentation or support as Java. We also ran into problems with SendBird, the sdk that allows us to create the 1:1 and group chats and properly populating the rooms with the individuals on our application. The matching algorithm that we have also took a bit to formulate! We are proud that at this current moment, we finished the application and it works! 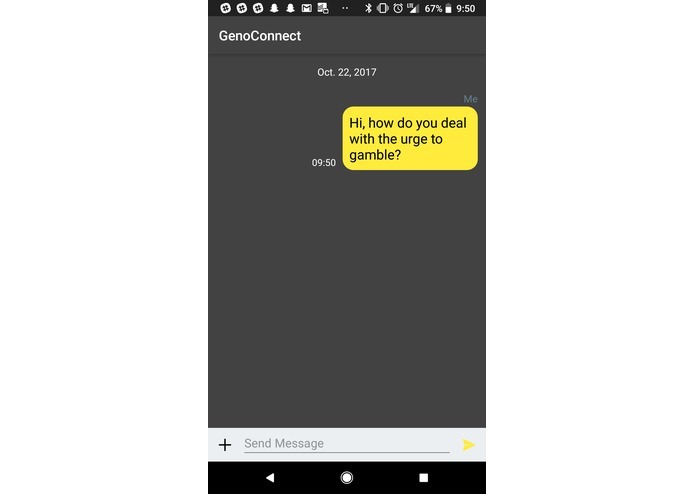 Users can connect with each other and chat based on their genomes and range of similarities that they enter! We learned how to use Kotlin more proficiently and how to implement chat groups within Android Applications using the SendBird sdk (and how to work with the Genome Link API). Additional filtering based on location, age, and more!